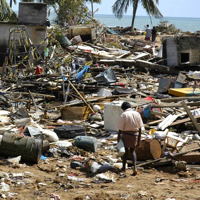 On Dec. 26, 2004, a massive earthquake shook Aceh, Indonesia, sending tsunamis racing across the Indian Ocean to shatter communities as far away as Somalia. Many of the countries struck by the destructive waves were embroiled in major, often-violent, political conflicts at the time. Indonesia's Aceh province and Sri Lanka, the two worst-hit locations, had each experienced a decades-long internal conflict that had taken thousands of lives.